Plagued by corruption scandals, a sinking Brazilian economy, protests from young voters who scorn politics as usual and howls from an investor class that has lost faith in her ability to govern effectively, Brazilian president Dilma Rousseff could become the first president to lose reelection since the return of democracy to Brazil in 1985. In the first round of the Brazilian elections on October 5, she led the presidential vote against her center-right rival Aécio Neves by a margin of 41.59% to 33.55%, and she effectively vanquished former environmental minister Marina Silva, who emerged in late August as the chief threat to Rousseff’s reelection. Rousseff now faces a united opposition front — Silva earlier this week endorsed Neves, the candidate of the opposition Partido da Social Democracia Brasileira (PSDB, Brazilian Social Democracy Party). Notably, Rousseff’s governing Partido dos Trabalhadores (PT, Workers Party) lost 18 seats in the lower house of the Brazilian national congress. 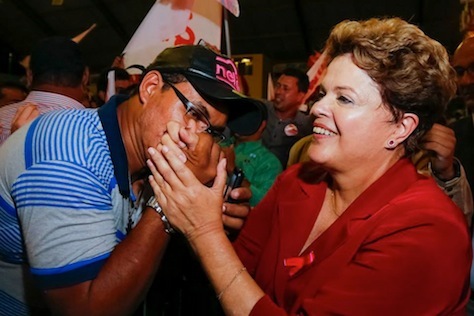 Accordingly, Rousseff faces a tough fight against Neves, the popular former Minas Gerais governor, and polls show that she very narrowly trails Neves in the October 26 runoff. Suffragio attempts to bring thoughtful analysis to the political, economic and other policy issues that are central to countries outside of the US -- to make world politics less foreign to the US audience. Suffragio focuses, in particular, on those countries and regions with upcoming or recent elections. Who is the most impressive foreign policy / security official (so far) in the Trump administration?